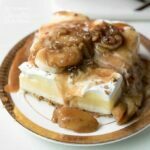 This Bananas Foster Lush recipe is 2 lush recipes in one because it is also a Banana Cream Lush. A rum-infused, banana-caramel sauce brings this Classic Banana Cream Lush Layered dessert to a whole new level. Bottom Graham Cracker Crust (for a no bake crust option): In a medium-large bowl, mix melted and cooled unsalted butter with finely ground, processed graham crackers. Press into the bottom of a 9 x 13 pan. Cover and chill until the next layer is ready. Whipped & Toppings Layer: Spread thawed whipped topping on top of the banana cream pudding layer. Optionally, you can freeze the Bananas Fosters Lush overnight (without the Bananas Fosters sauce) for more defined slices. Do not freeze if you substitute homemade whipped cream because it might not hold up like frozen whipped topping like Cool Whip. Bananas Foster Sauce for Serving: In a large, heavy skillet, over medium heat, melt the unsalted butter and add the brown sugar, stir until combined. Add the cream, bananas and nuts. Mixture should bubble but not burn. Pour in dark rum and combine. Using a lighter wand light the mixture and it should go out on it's own. Remove from heat, stir in cinnamon and optional vanilla extract. Ladle over a slice of the lush. You can also keep the sauce in the refrigerator. Please note: Be careful of the open flame! If you don't want to ignite the rum, just cook the sauce for 1-2 minutes. I suggest using an offset spatula for spreading the layers and make sure it's clean before starting a new layer. After refrigerating, for serving to show more defined layers, you can just take a butter knife and "wipe" along the sides and the layers will show nicely. You can freeze the Bananas Foster Lush overnight (at least 6 hours) to get more defined slices. Make sure you use a sharp knife to cut down into the bottom crust first before removing with the spatula. It will defrost fairly quickly depending on the room temperature. This recipe for Bananas Foster Lush was printed from AmandasCookin.com - https://amandascookin.com/banana-cream-lush/ and can only be printed for education or personal use.